Reach the goal with limited ink! Shrinky Ink Station is a mission in the Octo Expansion. The player has to reach the end of the stage with a limited supply of ink. When the player begins the stage, they find themselves on a small platform ending in a grated walkway, and by falling down, they land onto another platform. 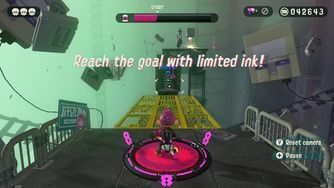 At the end of the platform there's a rotating block which the player shouldn't ink to climb it, but rather, they should wait and walk onto the sides of the block to the top to reserve ink. The player reaches a platform with a wall in the center, and an Octotrooper at the end. The player shouldn't attempt to splat the Octarian, but rather, approach it and let it drive off the edge of the platform as it retreats. The player has to ink a rotating Sponge Block to reach the next platform. To make progress, the player has ink and climb a wall with a Squee-G moving around on it. There's also a Dash Track on the wall and a Power Egg container. Try to use as little ink as possible to reach the Dash Track and land onto the next platform which consist of another four Dash Tracks. If the player times their jump right, they can collect some more Power Eggs by going through two Squid Rings before landing on the next platform. The next platform ends in five Sponge Blocks and a Balloon Fish in the middle. Ink the Balloon Fish to preserve the most ink as possible and climb the Sponge Blocks while avoiding an Octocopter that's floating around. Avoid the flying Octarian and just like before the player has to jump onto a rotating block and walk to the top instead of inking it. The player can take a risk when on the block and collect a Power Egg container as well as one on a Sponge Block passed the goal. To clear the stage, the player should ink the Balloon Fish instead of the Data Point to reach the goal. The title and subtitle of this station are references to the Shrinky Dinks toy line. The Japanese name of this station is a pun on "Shō ene rukku" (energy saving business suit), which is a buzzword from the 80's in Japan. This station has Nintendo's SNESs, SNES-controllers and SNES-cartridges floating around in the background. One-Shot Station has SNES-controllers floating in the background as well. The Dutch title of this station, "Alles Super?" alludes to the Super Nintendo Entertainment Systems. Reach the goal with a limited supply of ink! French Y a pas de petites économies ! Atteins l'arrivée avec l'encre fournie ! There are no small savings! Reach the finish with the provided ink! German Kein Angebot trotz Nachfrage! Erreiche das Ziel mit begrenztem Tintenvorrat! No offering despite demand! Reach the goal with limited ink-supply! Reach the finish with a limited amount of ink! Доберись до целе - краска ограничена! Doberis' do tsele - kraska ogranichena! ...100 in 1! Reach the goal - the ink is limited! Reach the goal with the assigned ink. ↑ "Wie wat bewaart, die heeft wat" is a Dutch saying for "saving things can be beneficial in the long run"
This page was last edited on 3 April 2019, at 20:35.